It’s that time of year again. The days are getting shorter and cooler, the last of the summer produce is being snatched up from the grocery store, and today was my last first day of school. (Until college, that is!) Every year it’s pretty much the same routine…as the end of August approaches, I start to get a little excited for school. I go school shopping and spend way too much money, scramble to finish all the summer assignments I’ve been putting off since June, and spend the last few days of summer soaking up the sun, hanging out with friends, and just relaxing….wishing that I could relax but being overwhelmed with work, helping my mom prepare her kindergarten classroom, and doing last-minute loads of laundry. Then I enjoy the first few day of school, getting to see all my classmates and breaking out my nice new school supplies, and right around day ten I’m ready for summer again. It’s a vicious cycle. 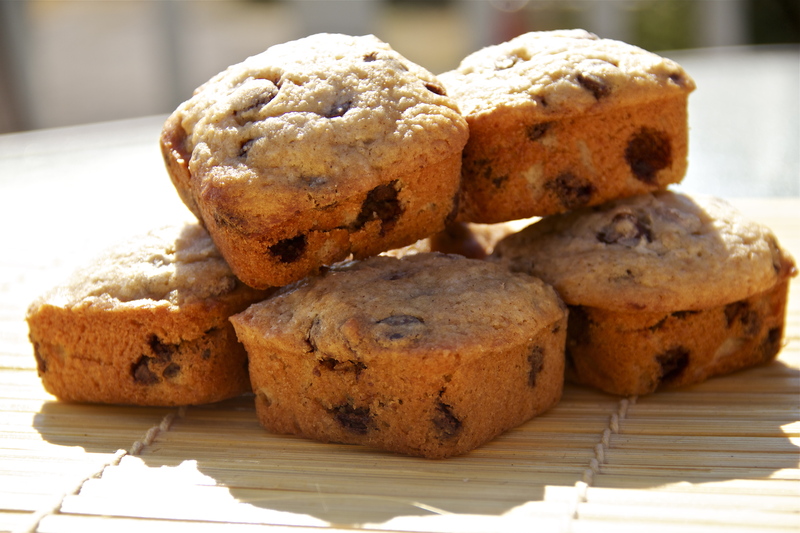 To make the kick-start to a new school year a little easier, I whipped up a batch of chocolate chip muffins, whose title appropriately labeled them “the best.” And that they were. Honestly more of a cupcake than a muffin (muffins are justifiable to eat for breakfast; cupcakes are not, so let’s agree to call them muffins), these were just what I needed to get me in a positive mood about my last year of high school. Their crisp, golden exteriors and tender, moist, fluffy, chocolate-studded interiors made it impossible to moan and groan about school. Quite literally, because of course my mouth was full of muffin. They also helped counteract the excruciating pain of changing my alarm clock setting from 9 am to 6:30. Gosh, I loved summer. 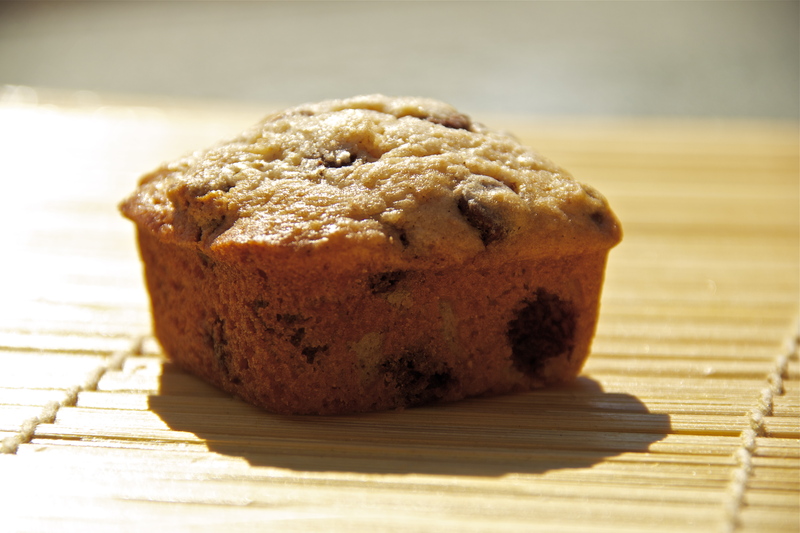 Preheat oven to 350 degrees F. Grease a 12-cup muffin tin (I used a square muffin pan) or line with paper liners. Set aside. In a large bowl, beat together the butter, sugar, baking powder, salt, vanilla, and cinnamon until light and fluffy. Beat in the eggs one at a time, and then stir in the milk. 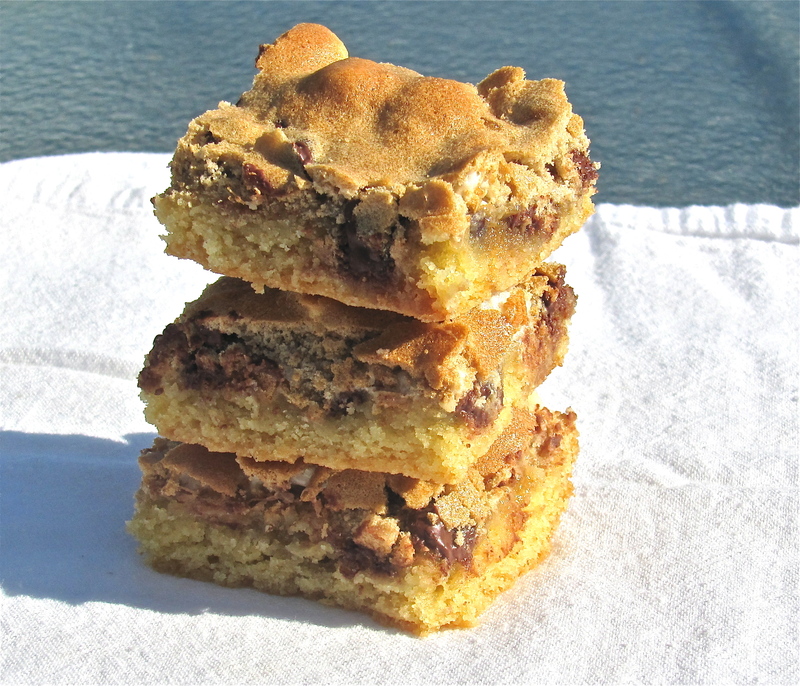 Stir in the flour, mixing just until combined, and finally stir in the chocolate chips. 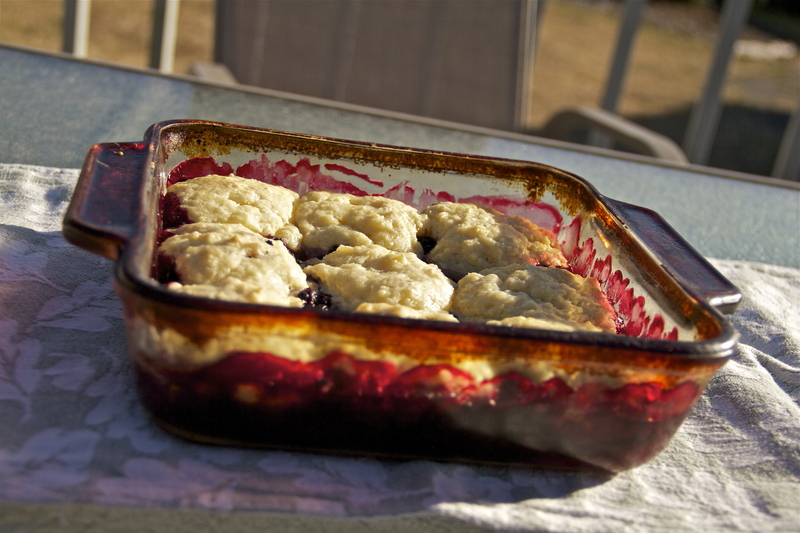 Spoon batter into the prepared muffin tins. Sprinkle with turbinado sugar (or any coarse sugar) and bake for 25-30 minutes or until inserted toothpick comes out clean. This recipe is a good example of mind over matter. I think that a lot of times, how things taste to us is only partly influenced by the actual food we’re eating. The rest is affected by what we think about what we’re eating. I think that a cool experiment would be to bring diners to an upscale, super-expensive restaurant and serve them generic, run-of-the-mill food presented in a fancy arrangement. Then you could give the same food, served with a less inviting presentation, to people in a cheap, low-quality fast-food joint and observe the two groups’ reactions. I’d bet anything that the people in the expensive restaurant would think their food tasted a whole lot better than that of the people in the cheap restaurant. It would all be in their heads! This thought-interfence is why it’s often said that food tastes better when someone else prepares it, and why parents are often successful in finding creative ways to sneak vegetables or other unsavory items into their children’s meals. It’s not only the actual taste of spinach (for example) that makes kids cringe; it’s the knowledge that their food contains it! 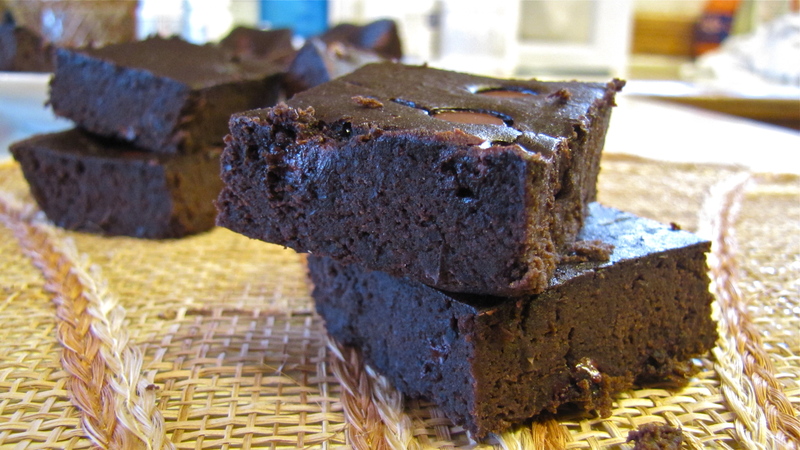 These brownies have a secret ingredient in them, and I think they’re much more enjoyable when eaten with an open mind or just plain ignorance. 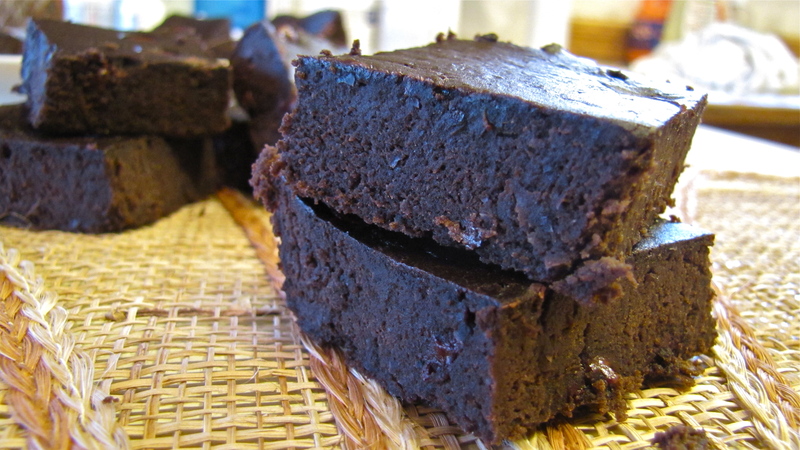 Since I was the one who made the brownies, I could taste the secret ingredient, but the rest of my family, who had no idea what it was, simply tasted a moist, chocolatey brownie. 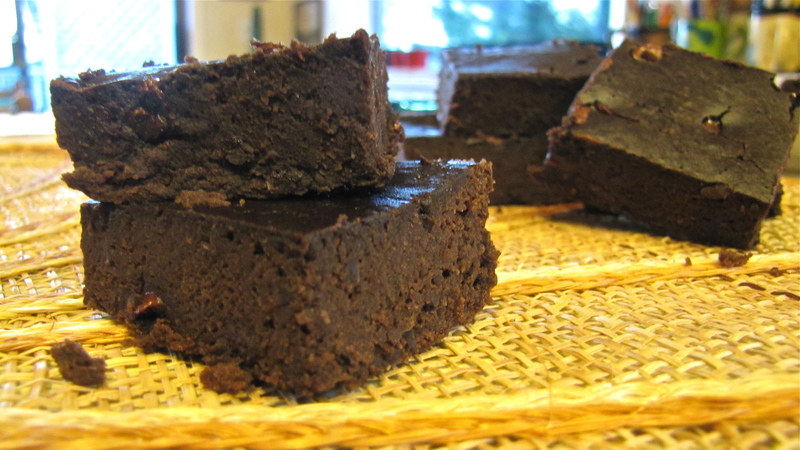 I won’t lie, these are brownies that have been bumped up several notches on the healthiness scale, and they really do taste different than your usual homemade, boxed, or store-bought chocolate brownie. But they taste different in a good way, and are still sweet, dense, and fudgey. Make these for your unsuspecting friends and family and do a little experiment yourself…don’t tell them about the black beans secret ingredient, and watch what happens. You just might be surprised! Directions: Preheat oven to 350 degrees F. Grease an 8″ x 8″ pan and set aside. Place the black beans, olive oil, eggs, and vanilla in a large blender or food processor. Blend or pulse until smooth. Add in the coconut sugar, baking powder, salt, and cocoa powder and blend again until smooth. Pour batter into prepared pan and sprinkle with chocolate chips. Bake for 30-35 minutes or until inserted toothpick comes out clean or with just a few moist crumbs. Let brownies cool in the pan before cutting. Yield: 12-16 brownies. *Coconut sugar is great in this recipe because of its not-overly-sweet taste and low glycemic value, which makes it healthier than cane sugar. However, if you can’t find coconut sugar in your store and don’t want to order it online, the same amount of regular granulated sugar is an easy substitute. Some nights, I love to make fancier, time-consuming dinners. I am by no means a fast cook, so I like to give myself plenty of time to prepare a complicated meal, which often means starting dinner in the afternoon. Not that I mind it! There’s something so relaxing to me about spending time in the kitchen cutting, peeling, measuring, and cooking. However, life often gets in the way of my lengthy dinner-making plans and sometimes I just need to make something that’s quick and simple, but better than plain old pasta or baked chicken, two of my old stand-by fast meals. 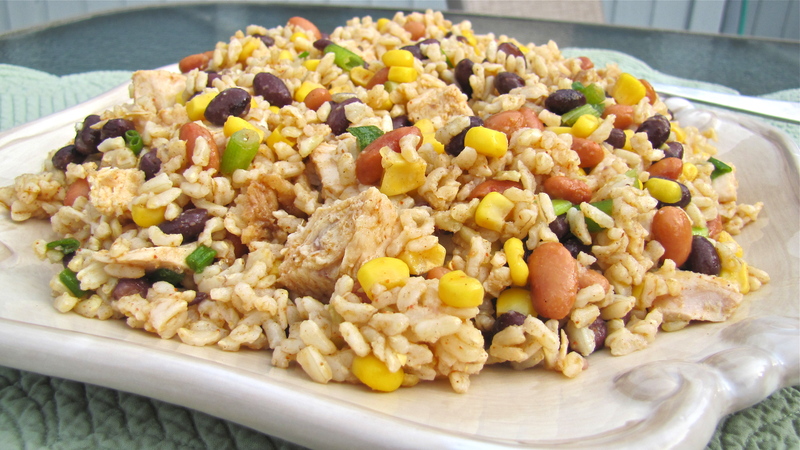 Enter this rice & bean salad, which is full of fiber, protein, and lots of good southwest flavor! I like to think of this salad as a main course and side dish in one since it contains rice, beans, chicken, and corn. And it’s highly adaptable! Use whatever kind of rice you have on hand (quinoa or barley would also be great! ), as well as whatever type of beans are in your pantry. Red onion can also be substituted for the green onions, lemon juice for the lime, etc. Furthermore, it all comes together in a flash; basically all you have to do is combine everything together. Aaand it can be served either warm, chilled, or at room temperature. Have I sold you on it yet? If not, let me mention that not only is this salad quick, easy, and changeable, it’s absolutely delicious! The dressing is slightly sweet, slightly tangy, and slightly spicy if you choose to add the chopped jalapeños. It lightly coats the hearty rice, beans, and chicken, and you get even get a bit of veggies from the corn and green onion. My mom summed it up pretty well by commenting that this was “the perfect dinner.” You don’t have to wait for a busy night to throw this southwest salad together…make it ASAP! 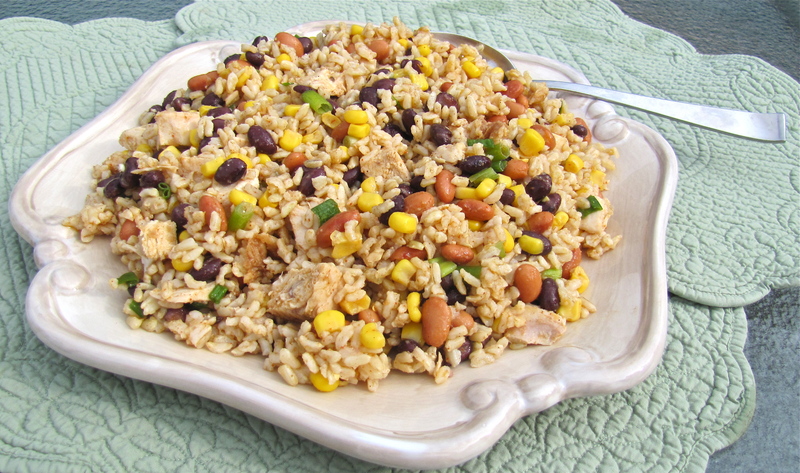 Combine rice, salt, beans, chicken, corn, and green onions in a large bowl. In a small bowl, whisk together lime juice, vinegar, brown sugar, olive oil, chili powder, and cumin until smooth. Pour dressing over the salad and toss to combine. Salad can be served warm, chilled, or at room temperature. Serves 8-10. The third week of August is, without fail, a crazy week. Summer job schedules are full-force, our county fair takes place, summer schoolwork is uncovered from the depths of procrastination, spending time with my horse is squeezed in whenever possible, and my birthday falls on the 15th. No matter how much I try to plan ahead and get things done in July, that end-of-the-summer rush inevitably arrives right around now. This year was no exception! Luckily, although I took a raincheck on entering baked-goods in the fair this year, I still had time to bake myself a birthday cake. I’m all about prioritizing when times get busy…should I wash my car, which is currently covered in a quarter-inch thick coating of dust, or sit outside in the sun? Get started on my English homework, or go for a run in the forest? Change my sheets, or watch an episode of Desperate Housewives? Responsibly, I picked the latter of all these tough decisions. Yep, I definitely have my priorities straight! So when it came to baking a birthday cake or giving my bathroom a much-needed cleaning, there was really no question. 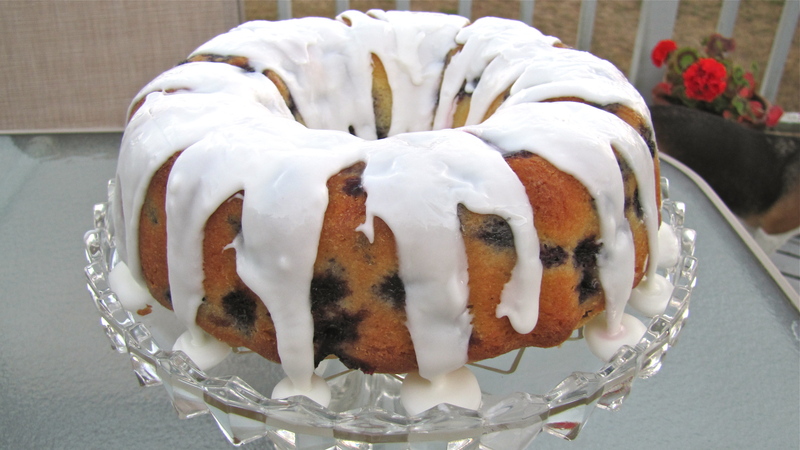 As for what I decided, this post should clue you in…..
After much debate, I finally settled on making this Blueberry-Lemon Buttermilk Bundt Cake. I usually go for a more traditional, 2-tier, buttercream-frosted birthday cake, but there was something about the combination of plump blueberries, fresh lemon zest, and tangy buttermilk that I couldn’t resist. And I’m so glad I didn’t! I couldn’t be happier with my decision. 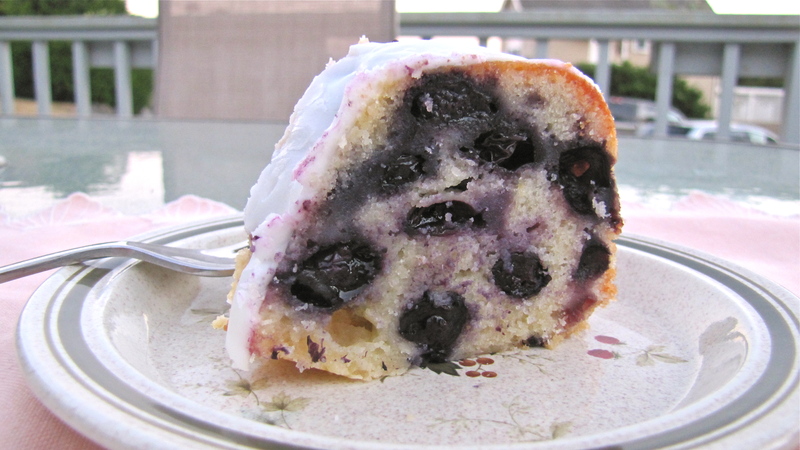 The result was an incredibly moist, lemony Bundt cake studded with sweet, juicy blueberries and topped with a tart-sweet lemon and buttermilk icing. It was the perfect end to a wonderful birthday…my eighteenth! Preheat oven to 375 degrees Fahrenheit. Grease and flour a 10-cup Bundt pan. Set aside. In a medium-sized bowl, whisk together 2 1/2 cups of flour, the baking powder, and the salt. Set aside. Place the sugar and lemon zest into a large bowl. Using your fingers, rub the lemon zest into the sugar until evenly combined. Add in the butter and, using an electric mixer on medium speed, beat until light and fluffy. Add in the eggs one at a time, beating on low speed after each addition. Add in the vanilla and mix until combined. Still on low speed, add in 1/3 of the flour mixture and mix just until flour is incorporated. Add in half the buttermilk, then another third of the flour, the other half of the buttermilk, and the last third of the flour, beating after each addition. 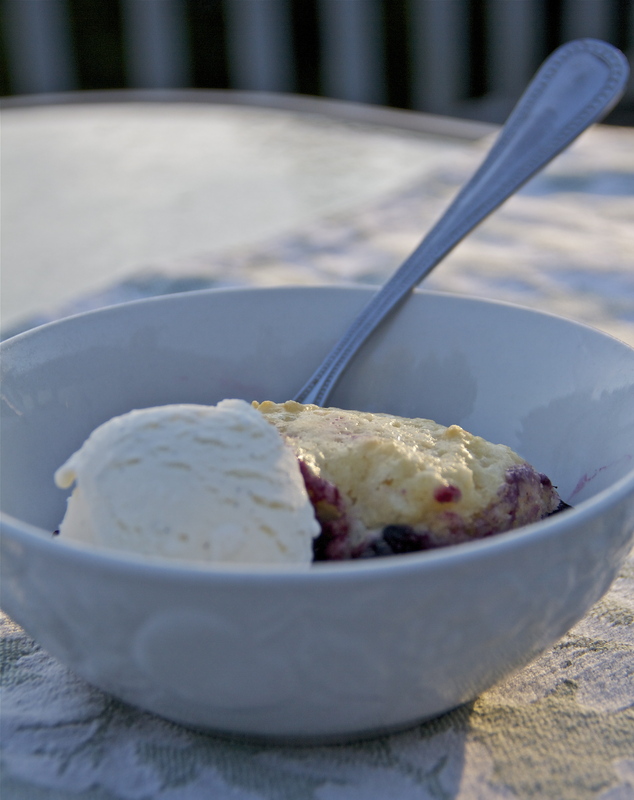 In another bowl, toss the blueberries with the 2 tablespoons of flour. Using a rubber spatula, gently fold the blueberries into the batter. Spread the batter evenly into the Bundt pan, smoothing the top. Bake for 55-60 minutes or until an inserted toothpick comes out clean. Let the cake cool in its pan on a wire rack for 30 minutes before removing from pan to cool completely. When cake is completely cool, whisk together the powdered sugar, buttermilk, lemon juice, and butter until smooth. For a thinner glaze, mix in additional buttermilk or lemon juice 1 teaspoon at a time or until it reaches your desired consistency. Spoon the icing over the cake using a knife or offset spatula, spreading it downward every now and then. Store the cake at room temperature, loosely covered in plastic wrap, for up to 4 days. I happen to love the TV show The Office. It seems to be one of those shows that people either hate, or love. 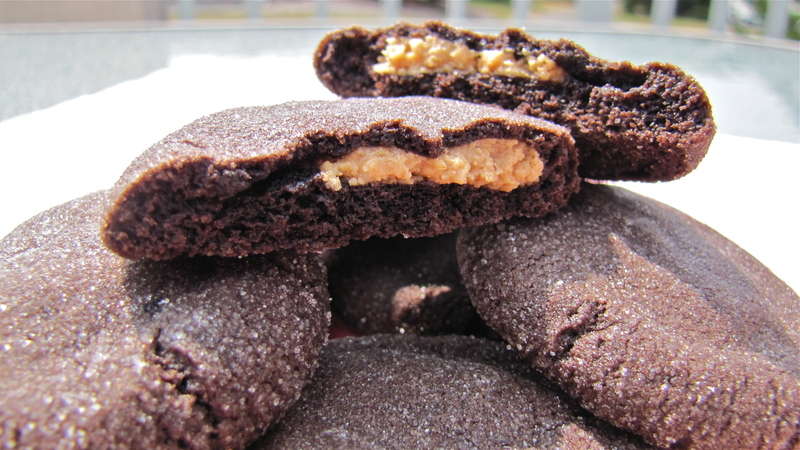 So if you’re a member of the former group, or you have no idea what The Office is, feel free to skip down to the bottom of this post, where I’m sharing a fantastic recipe for Chocolate Peanut Butter Surprise Cookies. I promise I won’t be offended; it’s almost impossible to get upset when you have one of those cookies in your hand! Preheat oven to 375 degrees F. In a medium-sized bowl, whisk together the flour, cocoa powder, baking soda, and salt. Set aside. In a large bowl, using an electric mixer, beat together sugars, butter, and peanut butter (1/4 cup) until light and fluffy. Add in the vanilla and egg, beating until creamy. Gradually stir in the flour mixture, mixing until combined. Set aside. In another medium bowl, stir together powdered sugar and 3/4 cup peanut butter until smooth. Scoop up a heaping tablespoon of the cookie dough and flatten it slightly. 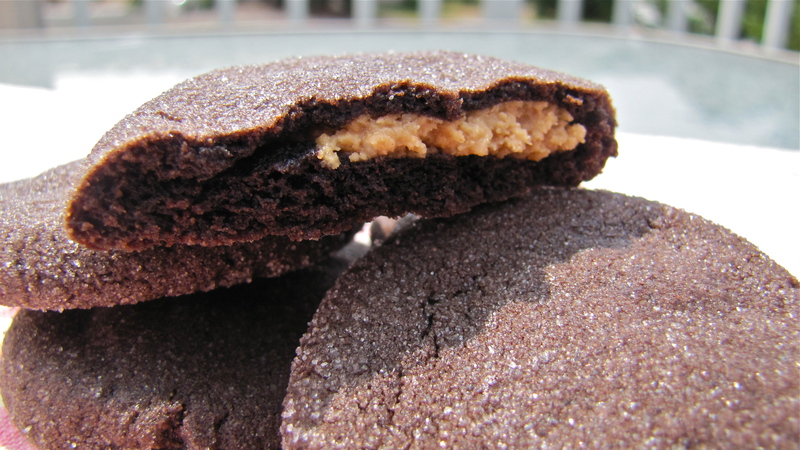 Place about 1 teaspoon of the peanut butter mixture in the center and wrap the dough around it, pressing to seal. 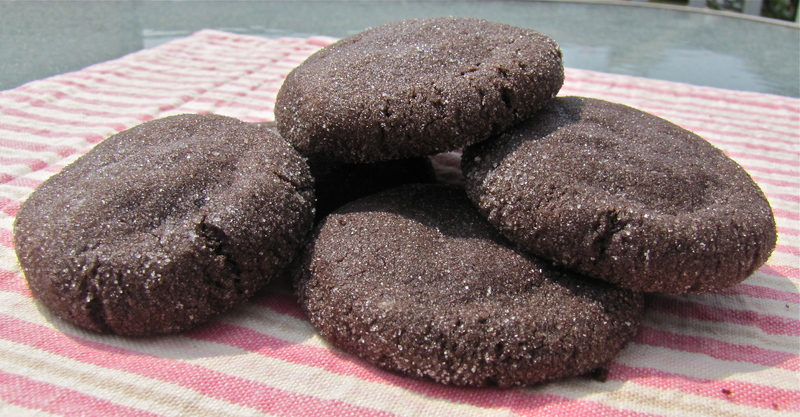 Roll the cookie into a ball and roll in the additional granulated sugar. 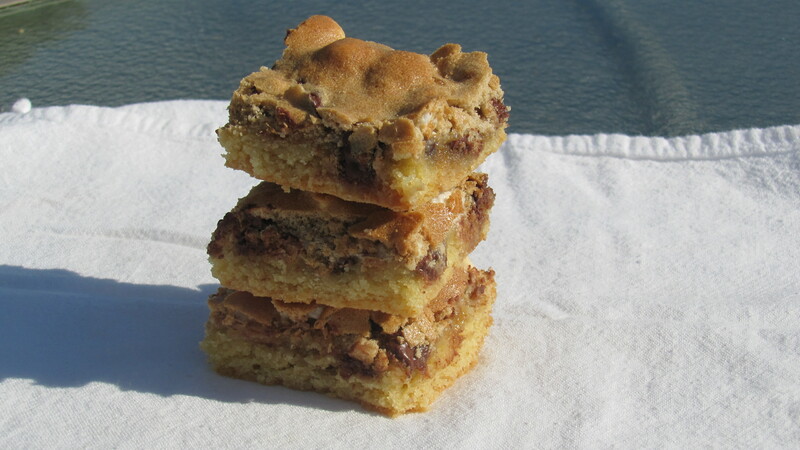 Place on a parchment-paper-lined baking sheet and flatten to 1/2-inch with a drinking glass. Repeat. Bake the cookies for 7-9 minutes, or until edges are set. Let cool on the baking sheets for 3 minutes before transferring to a wire rack.